A few surfable tracks, some hints of reverb, and those infectious percussive rhythms found throughout Lebanese belly dance and traditional music make this very entertaining, even though it's not a surf release. Ominous and unusual for sure, the opening of "Alf Layla" soon becomes a simmering undulating belly dance that builds fever and anticipation. The melody is quite surfable here, and the percussion very cool. "Hazihi Laylati" is almost psychedelic, with gentle reverb and liquid imagery, and a backwards sense about it. A little reverb on the guitar and a surf beat, and it would be very scary. With chamber 'verb rising in anticipation of notes, "Fakarouni" takes on a surreal air like a psychedelic symphony. very interesting. Like a mixture of French sidewalk cafe and Lebanese bazaar, "Oua Marat Al Ayam" sports some surfable guitar tone in enough spots to bring forth images of the curl on forbidden bays. The dramatic opening is lush and haunting. The guitar maintains a surfable sense throughout. Delicate guitar lines address the opening of "Amar Hiyati" as if it's a prelude to a dangerous intervention. The guitar plays a primary role, and though it's dry, speaks to the sea. very nice track. On a psychedelic wave of desert air, "Men Ajel Ayneyk" employs a long and dramatic opening to get to a belly dance at the beach. Surfable guitar lines and circular riffs make this a fine track. 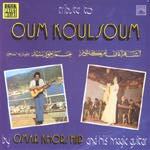 "Anta Oumri" is pretty poppy, yet fluid and percussive. To my ear, it seems a little contrived compared to the rest of these tracks.